Tags: Antique Print, Asia, Buitenzorg, Indonesia, Java. No. 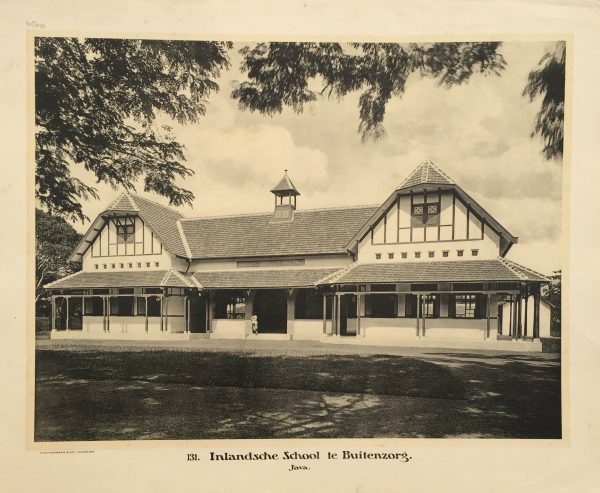 131 Inlandsche School te Buitenzorg (Java). 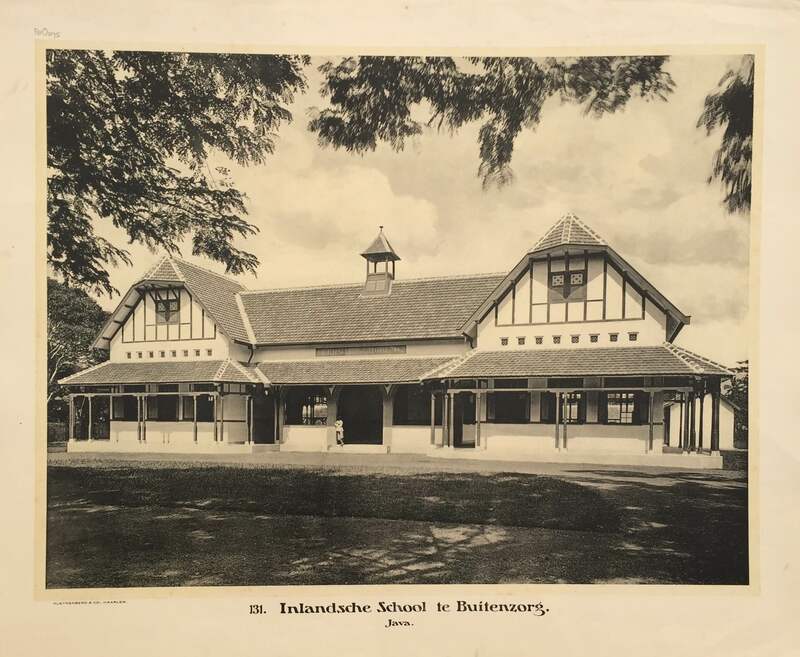 Antique print depicting an inland school in Buitenzorg. This photograph depicting the Dutch East Indies was originally published as part of an information series for school children. It consisted of 170 educational prints and covered a diverse range of subjects, separated into two parts: numbers 1-150 depicted places and people in the Dutch East Indies and numbers 151-170 depicted places and people in the Dutch West Indies. The first 150 photographs of the collection are attributed to the photographer Jean Demmeni (1866-1939), whose pictures provided the Dutch public with some of the first photographic depictions of the colonies that they had read so much about. Demmeni was born in Padang Panjang in West Sumatra, the son of a native woman of the island of Madura and a Frenchman who had left his country to join the Dutch East Indies Army. Demmeni followed in his fatherʹs footsteps and, after technical training in Holland, entered the Third Infantry Regiment in 1887. He was seconded to the topographic unit of the armed forces and in 1894 was assigned as the official photographer to an expedition to Borneo led by Dr. A.W. Nieuwenhuis. Demmeni was then employed by the Topographical Service at Batavia from 1911 until 1920, after which he worked as a photographer at the Central Office of Dactyloscopy. In the biography of Jean Demmeni Indonesia: Image s of the Past (Singapore: 1987), Leo Haks described him as ʹone of the first photographersʹ to capture the islands of the Indonesian archipelago, and called his work a ‘vital contribution to Indonesian history and the art of photography’ which ʹprovides a comprehensive record of the Indonesian islands at the turn of the century, unmatched in its singular insightsʹ. This selection of photographs shows interesting details around the expansion of industries such as tobacco (a lucrative export) in the area, and the local processes of production. The group also records the religious influences in the region, showing Islamic and Christian presences in local communities. Islam had been established in Indonesia since the fourteenth century, and colonial European settlers had ushered in a new phase of Christian proselytising around the Pacific Ocean – one which was frequently characterised by notorious insensitivity towards the indigenous population. However, these photographs demonstrate the more tolerant educational interest being taken at the beginning of the twentieth century.